We can create two types of applications in .NET Core. Portable applications are applications which expect .NET Core runtime on the deployment machines. It cannot be run on a machine which does not have .NET Core runtime installed. 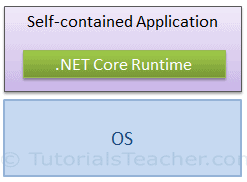 Self-contained applications are applications which include .NET Core runtime when we publish it. It can run on a machine which does not have .NET Core runtime installed. We can configure ASP.NET Core application as portable or self-contained application using type property of Microsoft.NETCore.App dependency in project.json. 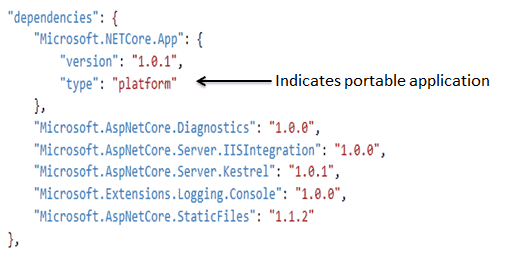 The "type":"platform" indicates that this application expects .NET Core on the machine. This makes it a portable application. For the self-contained application, remove type-platform from the dependency. This makes it a self-contained application which means .NET Core will be included when you build and publish an application.